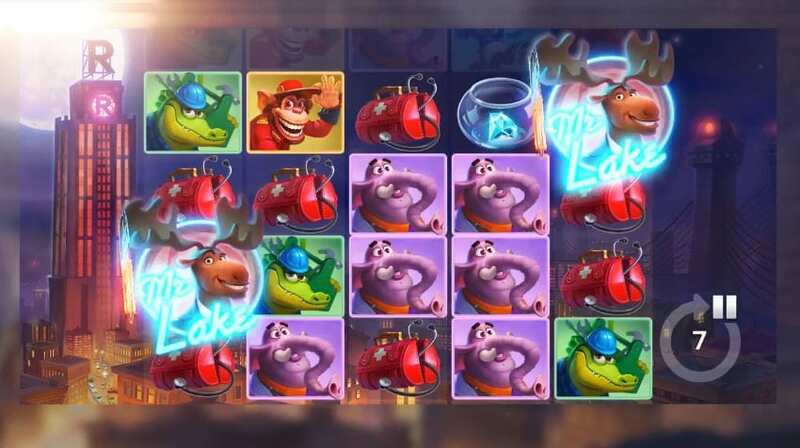 Inspired and created by ELK Studios, Lakes Five is one of the unique slots that you’ll find online. Set in the backdrop of an incredible city, Mr Lake and his five most trusted companions are coming together to carry out an outrageous heist of Mr Romano’s massive fortune. This 5x4 reel slot has 178 ways in which you can win and was initially created as a mobile first design. Just like every ELK Studios game, the design of the game is amazing and the in-game bonus features are there to match. Join Mr Lake and try to collect a fortune for yourself on Wizard. Discover slot games online from ELK Studios' pool of their best games. Lakes Five immediately strikes you as a vibrant game, the futuristic backdrop with Mr Romano’s tower building sets the tone for an epic experience. The disco music and typical street noise surprisingly works well together and gets you in the mood for some real money spins. Looking for the best video slots based on odds? As far as the gameplay goes, the board is full of a variety of symbols, such as Medical bags, diamond fish bowls, Elephant, Alligator, Monkey, Parrot and Goldfish. Connecting with the Goldfish symbol across all 5 reels can deliver a huge pay-day. Not only is the base game full of action, but you’ve got WILD re-spins and The Heist BONUS Game to keep the wins rolling in. WILD RESPINS – The WILD re-spins are triggered when you hit two SCATTERS. The SCATTERS then turn WILD and move down one position on their select reels for every re-spin. THE HEIST BONUS GAME – You will trigger The Heist BONUS GAME by hitting 3 SCATTERS. You’ll receive 10 free spins and every key you hit in the BONUS GAME counts for an extra spin. WALKING WILD – The WALKING WILD shifts one reel to the right for each spin. STICKY WILD – The STICKY WILD remains in the same place for the remaining free spins. CLIMBING WILD – The CLIMBING WILD shifts one position up for each spin. Additionally, if any of the WILDS overlap, they’ll generate a 2x or 3x multiplier for that specific spin. It's undeniable that Elk Studios have created another great slot to go into their gaming directory. The smooth design, adventurous storyline and vibrant music keep you gripped. Although the variance is medium to high, there are plenty of ways in which you can recover your bankroll and take a healthy profit away from this game.